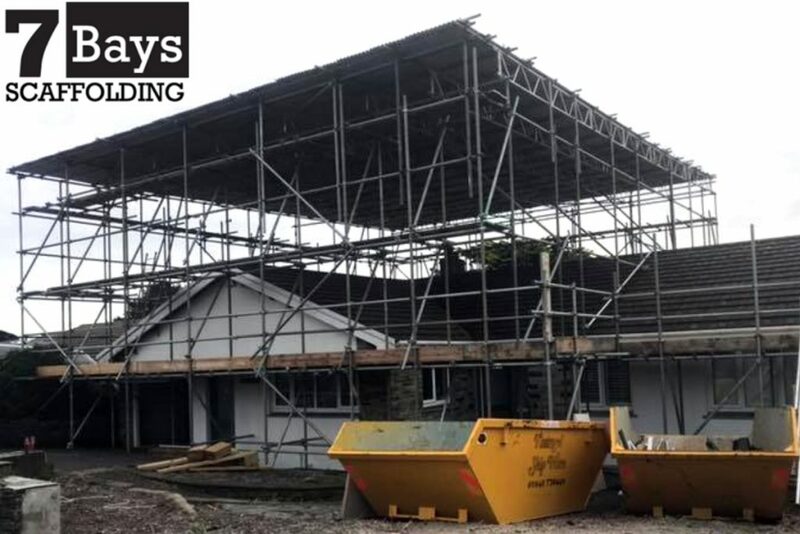 At this time of year, the weather takes a turn for the worse and here at 7 Bays Scaffolding we see an influx of enquiries about fitting temporary roofs in Cornwall. Temporary roofs can be crucial for the renovation of buildings; they protect from weathering and stop the building’s structural design being weakened. Sometimes we fit temporary roofs as a means of controlling the environment – where specific temperature or humidity control is required for instance. Installing a temporary roof also helps to protect your workers from rain, snow and wind chill which in turn ensures that work can continue in all weather conditions. Temporary roofs help you to complete your construction projects on time, no matter what the weather. With the threat of lashing rains and strong winds it’s a good idea to protect your construction projects and make sure that any existing buildings are adequately protected over the winter months, and indeed all throughout the year as British weather is notoriously unreliable. We provide many temporary roofs for homeowners, trade firms and construction companies in Cornwall and beyond. 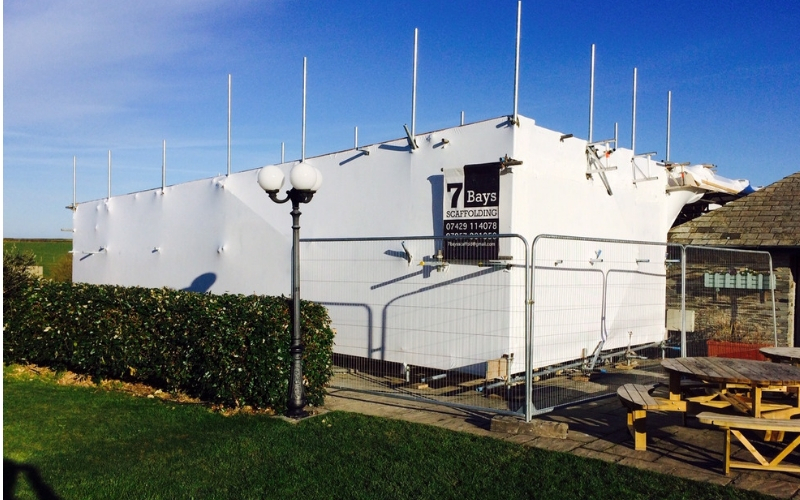 7 Bays Scaffolding is one of the leading temporary roof fitters in Cornwall so take a read below at the information we’ve put together about temporary roofs in Cornwall to explain what we do and why! A temporary roofing system provides weather protection for any building that needs safeguarding. The most common type of temporary roofs we install are constructed using aluminium beams with corrugated metal sheets used for the roof covering. This type of temporary roof cover is lightweight and easy to transport which means we can get the job done quickly and efficiently. Using a traditional scaffolding method, we first build up the scaffolding to the height of the temporary roof. As with all our scaffolding constructions, we then make sure that the scaffolding is secure and stable so that we can then safely start the temporary roof installation process. After installing the scaffold beams to span the property, we install tubes perpendicularly to strengthen the structure and to support the corrugated roofing sheets and form the temporary roof. The sheets of corrugated aluminium are laid over the roof in an overlapped tile configuration. We then make sure that the sheets of corrugated metal are secured at every end to make sure that they don’t come loose, and to ensure they withstand weather and other outside influences. Following this we can completely encapsulate the structure by wrapping the sides of the scaffold with a choice of materials which can vary (depending on the specifics of the project). We use the latest, most efficient shrink-wrapping technology when installing sides to completely weather-proof your construction project and enclose the temporary roofing structure. Shrink-wrap is the most reliable method of containment and we find that it protects most effectively against side winds and strong weather conditions. The shrink-wrapped design allows natural light to enter the site so that it remains a safe working environment for your team, and it is also 100% recyclable which makes it environmentally friendly. Shrink-wrapping is versatile, lightweight and gives a drum-tight finish which looks professional and smart. Another temporary roofing containment solution we offer as an alternative to shrink wrap is Monarflex sheeting. 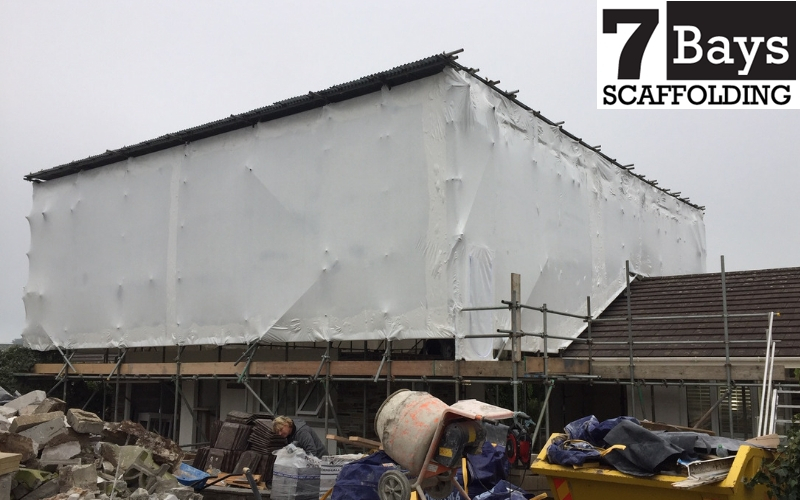 This specialist plastic sheeting is secured to the side of your temporary roofing structure using bungee cords to safeguard your site. Although cheaper than shrink wrap, this type of containment solution can sometimes be susceptible to high winds and doesn’t tend to contain the area as effectively as the shrink wrap option. That said, if your temporary roof requirements mean that you want a quick low-cost solution then Monarflex is a good choice. We can create bespoke temporary roofs for buildings and structures of any shape, size and dimension to ensure a safe fit for all scaffolders tradesmen who will be working on the structure. Don’t leave the weather to damage your roof or construction project this winter! Call our team of highly skilled scaffolders and we can discuss your temporary roofing requirements. We focus on customer satisfaction and delivering the best service possible and would love to offer you advice on the type of temporary roof you would need for your property. Get in touch today for a free quote on temporary roofs in Cornwall. Our scaffolders in Newquay provide all aspects of residential and commercial scaffolding services throughout Newquay, Cornwall and the surrounding areas. Free scaffolding quotes are always provided.